"Beginning in 1871, the Town began to repurchase some land it had previously sold between Church Street and Lake Quannapowitt. Improvements were made each year through enlargements and beautification of the area, assisted by the will of Cornelius Sweetser, who bequeathed $10,000 to 'extend in furnishing and beautifying a public park.' Land gradually came into the hands of the town through transfers and sales. 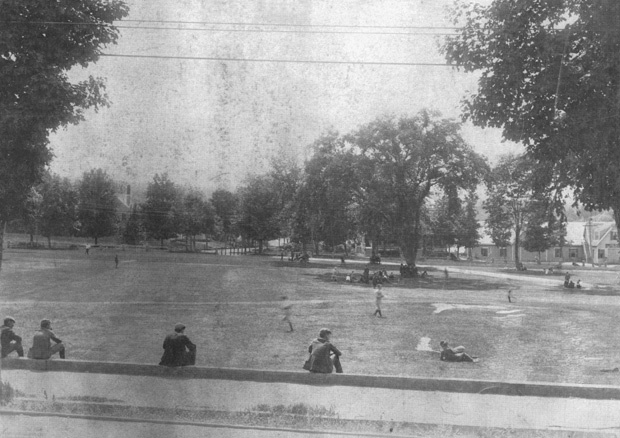 By the turn of the 20th century, the land was being used as a park where Wakefield High School baseball teams played their games. The Wiley Boathouse (seen at right in the photo) offered rowboats, sailboats and canoes to Wakefield residents for many years. A dance hall was added in 1912 to the second floor of the boathouse where the big name bands played." -- Text from calendar by Jayne M. D'Onofrio. “Wakefield Common, circa 1900,” NOBLE Digital Heritage, accessed April 20, 2019, https://digitalheritage.noblenet.org/noble/items/show/7119.